"I learned to fly to be able to join the WASP...and had to stand up really tall to qualify for the height measurement of 5' 2 ½." The daughter of Budd and Mary Phelan, Margaret was born in a pioneer log cabin on her parents' farm outside Emmetsburg, Iowa, on September 20, 1923. At a very early age, Margaret taught herself to read. When she had read all of the books on the children 's shelf at the local public library, she talked her mother into surreptitiously checking out adult fiction for her. After graduating from St. Mary's Academy in Emmetsburg in 1940, she attended Clarke College in Dubuque, Iowa, for two years, before going to Burbank , California to work as a draftsman for Vega Aircraft Corporation , a defense plant. Margaret learned to fly so that she could apply to join the women pilot training program. She applied after receiving her private pilot license and completing the required 35 hours. In 1943, following a personal interview and an Army physical, she was accepted into class 44-W-5, traveling to West Texas during one of the coldest winters on record, arriving at Avenger Field in mid December. 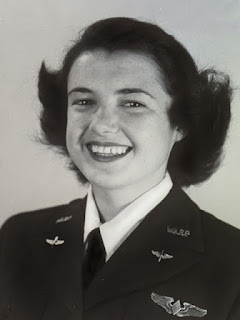 After completing 7 months of AAF flight training, Margaret graduated and was sent to Stockton Air Force Base, California. She flew as an engineering text pilot, checking out overhauled twin-engine UC 78's so that they passed inspections for the cadets to fly. She also ferried war weary planes to Texas and to the Arizona desert. The WASP were disbanded in December of 1944, and in February of 1945, Margaret married Jim Taylor, an Army Air Corps pilot she had met at Stockton Field. Following the birth of their son, Clif, and daughter, Merridee, she returned to college, earning her B.A. degree in Education from San Francisco State College in 1954. She worked as an elementary school teacher following graduation. In 1955 Margaret and Jim moved to Palo Alto, where she later worked at Stanford Bookstore. Margaret and Jim traveled extensively , visiting South America, Europe, Russia, Australia and the Far East. She and Jim celebrated fifty years of marriage in 1995. All the while Margaret continued to read voraciously, and was an accomplished cook, seamstress, and knitter as well. In 2010, Margaret , along with other members of the W.A.S.P. were invited to Washington, D. C. and awarded the Congressional Gold Medal for their service during World War II. Margaret passed away on July 1, two days after suffering a massive brain hemorrhage at home. She is survived by her children, Clif (Jane) and Merridee Taylor, her ''darling '' grandsons Jamie (Holley) and Daniel (Lisa), her great granddaughter, Sophia Margaret , her sisters, Helen Augustine and Kay Pitcher, and various nieces and nephews. Of all the passions Margaret displayed, none was more special than her gift for reading. She shared it with others all her life, and continues to inspire us all today. "My real specialty is reading. I have been a bookworm all my life, and I am still at it. Three of four books a week. I hope my eyes will hold to the end." Her legacy of service lives on through her family and all of those lives were touched by this special WASP. Respectfully posted by Nancy Parrish from the official obituary-- edited for the Final Flight pages with WASP information added for accuracy. *Quote from "Out of the Blue and Into History" in Margaret's own words (p. 392). Book edited by WASP Betty Turner. Photo from Wings Across America.